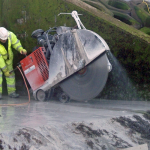 Work included the formation of access openings in the roofs of the outfall chambers, and then formation or enlargement of openings between the chambers using a variety of diamond drilling, sawing and controlled demolition techniques. 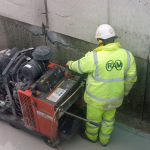 Wire saw, track saw, core drilling and robotic demolition using a Brokk 90 implement carrier were utilised during the work. 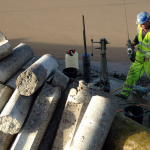 Work was undertaken using confined space trained operatives in accordance with safe systems of work developed with Land and Marine staff on site. 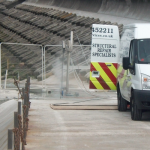 Ram Services Limited has completed similar schemes elsewhere for United Utilities Water and Yorkshire Water.